Your kitchen faucet has evolved over the years to include many different varieties, finishes, features, and extras. Yet, the functionality and installation of your kitchen faucet has remained mostly unchanged. “Kitchens sell houses” is a statement that many Realtors live by, and the type of faucet you have in your kitchen may seem like an insignificant consideration. Truth be told however, it can mean the difference in selling your home quickly and for top dollar, and never getting an offer. As a Realtor for many years, I have studied the buying habits of people quite closely. It is true that kitchens sell homes. It is also true that if the woman does not like the kitchen faucet, it is a safe bet that it will be on to the next home on the list. This is true even despite the fact that changing out a kitchen faucet is not, in most cases, a big job. I will describe how to fix a leaky kitchen faucet, how to replace a kitchen faucet, and when to know it’s time to call a plumber to do the job for you. Some kitchen faucet repairs are easily fixed. Plumbers can be expensive, sometimes very expensive. Many plumbing repairs are relatively simple, and inexpensively accomplished. Many of these repairs can be done by the homeowner given a few basic tools, and some plumbing knowledge. There is however, a limit to what the uninformed, ill prepared homeowner should undertake. The first thing we need to know is where the faucet leak is coming from. Is it coming from the base of the faucet? Is it coming from the handle? Is it coming from the nozzle or spout? Is the leak coming from the nozzle? (Single handle or two handle faucet) This is the most common kitchen faucet leak. If it is a two handle faucet where there is one handle for the cold side, and one handle from the hot side, and the leak is coming from the nozzle, put your finger under the nozzle to see if the drip water is cold or warm to hot. This is also applicable for most two handle bathroom faucets. If the water is warm to hot, you know that the leak is coming from the hot handle. Conversely, if the leak is cool or cold water, you know the leak is coming from the cold handle. In this type of leak where the water is dripping from the nozzle on a two separate handle faucet, the most likely culprit is a valve seat washer and/or the valve seat. Once you have determined which side the leak is coming from, go under the sink, and close the shut off valve on the corresponding side. Make sure it is shut tight. You can also shut the water off at the main, to be sure. The main shut off valve is normally located close to where the water line comes into the house. Usually in a basement. With the water shut off, turn on the faucet to bleed the line of any residual water. Once this is done, you will need a screwdriver to pry the H or C button off the top of the handle. You will then need either a phillips head screw driver or a slotted head screwdriver to unscrew the screw that is holding the handle on to the . Then remove the handle (you may need a handle puller if it is stubborn). You will then need a pair of pliers or an adjustable wrench to remove the valve from its base. Once you have removed the valve, turn it upside down, and you should see a black washer at the valve’s base. It will likely have a large furrow in it, or it may be even more damaged. If you place your finger in the hole in the faucet, you should feel a raised seat that has chips in it, or has an uneven surface. At this point you have some options. Use the tool to smooth out the pitted, uneven seat. Replace the seat washer, and reinstall the valve, and the handle. Turn the water back on, and see if the leak is fixed. Another option is to buy a seat removing tool at your local plumbing supply store. This tool is usually less than 10-12 dollars. Remove the seat at the bottom of the hole opening in your faucet. Bring the seat back into the plumbing supply store, and buy a new seat, and seat washer. Install the new seat into the hole in the faucet. Replace the old seat washer with the new seat washer, and reinstall the valve back into the opening in the sink, and reinstall the handle. Turn the water back on under the sink, turn the water on at the handle, and see if this fixed the leak. You can also try replacing the entire valve, but if the new seat and washer didn’t fix the leak, it is not likely that a new valve will either, at least not for the long term. The new washer at the base should work for a while, until the pitted seat forms a new furrow in the washer, and allows the water to leak through again to the nozzle. If none of these options fix the leak, it is time to look for a new faucet. If you have a leak coming from the handle itself, it is usually an o-ring on the valve that is to blame. Follow the steps above, remove the valve, and either remove the o-ring on the valve and take it to your local plumbing supply for a new one, or take the entire valve into the plumbing supply for a new o-ring. You may want to pick up on o-ring pic at the plumbing supply or hardware store, but a pin can also do the job. It is a good idea once you have the valve out, to inspect the seat washer to see if it may need to be replaced also. In addition to the new o-ring, you will need a little plumbers grease to apply to the outside of the new o-ring to ensure easy reinstallation of the valve. This should stop the leak, but if not, you can try a new valve. If a new valve doesn’t work, it’s time to look for a new faucet. Single handle kitchen faucets leaks are fixed by a repair kit or a new cartridge. If you have a single handle faucet where the water temperature, and volume is conrtolled by a single handle, and the leak is coming from nozzle, you are likely in need of a new single handle repair kit or a new cartridge, depending on the make and model. Go under the sink, and shut the water off on both sides, the hot side, and cold side. Depending on the maker of the faucet, you should be able to unscrew the nozzle at or near the base of the faucet. If you use a wrench, use a cloth between the wrench and the faucet to keep from scratching the finish of the faucet. You will also need an hex key set or an allen wrench if your faucet has an allen screw at the back of the handle, which many do. This should reveal a ball with a stem on it, some rubber barrel type washers, and springs. Note how they are installed, then remove all of these, note the manufacturer of your faucet (you may even want to take a picture of the faucet), and take them to your local plumbing supply. Buy the correct repair kit, install it, and reattach the faucet nozzle. Turn the water on under the sink, and see if the leak is fixed. If it isn’t, check to be sure you have the correct repair kit. If you do have the correct repair kit, and it doesn’t fix your leak, it is time to look at a new faucet. This is the set up for many single handle kitchen faucets like Delta, and others. Some single handle kitchen faucets like Moen use a cartridge instead of the ball and stem, rubber washers, and springs. You should approach the repair in the same way, and replace the entire cartridge if applicable. If there is a leak coming from the base area(at bottom of single handle), it is usually an o-ring that goes around the inner section of the base, and the inner wall of the faucet. These o-rings, depending on the manufacturer are usually included in the repair kit. There also may be a ball with a stem on it that may be the culprit, and may need to be replaced. Again, it depends on the maker of the faucet. Best rule of thumb is to replace the simple, inexpensive parts first, and try the other parts if not successful with the simple ones. If you have a leak coming from the very bottom of the faucet. (Usually a large rectangular piece that runs along the sink) Follow the instruction above about turning off the water to the faucet. Go underneath the sink, and you will see two or three nuts that secure the faucet to the base of the sink. Gently pry the rectangular base away from the faucet. Inspect the rectangular base to make sure there are no cracks, holes, or deterioration. If not, clean any residue on the area of the sink where the faucet base was sitting. Buy some plumber’s putty from your local plumbing supply, or hardware store. Apply a ring of plumber’s putty around the inside bottom of the base. Reattach, and tighten the nuts that you loosened. Also reattach any supply lines you may have undone. This should fix the leak. If it doesn’t, it’s time to look for a new faucet. Replacing a kitchen faucet with a new kitchen faucet is, in most cases, a relatively easy job. This is assuming that the shut off valves under the sink that the control the hot, and cold lines are working properly, and not deteriorating. This is also assuming that your supply connections under the sink are not soldered together. If you encounter soldering, it’s probably time to call a plumber. If the supply line valves are working fine, and looking fine, and there is no soldering to the bottom of the faucet, go ahead and shut the supply valves off. You may also want to shut the water off at the main just in case. With a pair of pliers, or an adjustable wrench, unscrew the supply lines from the shut off valves, and from the bottom of the faucet. You will also need to unhook/unscrew any sprayers your faucet may have. You may also need a plumber’s wrench with a swivel head to help remove the nuts that secure the faucet to the sink. This will depend on the amount of space you have underneath to access the faucet. Don’t discard the supply lines as you will need to take those with you when you buy your new faucet, so that you will know the size of the thread on the shut off valves for your new supply lines. I strongly suggest you buy new supply lines even if the existing supply lines look fine. Supply lines are normally inexpensive, and you don’t want to risk that your existing supply lines are worn out from the inside from being under pressure. You may have to change them anyway depending on the size of the new faucet hook ups. Unscrew the nuts that are holding the base of the faucet to the sink from underneath. This should release the faucet from the sink. You may have to pry the base of the faucet from the sink using a putty knife or a slotted head screwdriver. Once you have the faucet free from the sink, you can either take the entire faucet with supply lines with you into the plumbing supply or home store to buy your new faucet. This will allow you to buy a faucet that will fit your existing sink dimensions. If you would rather take measurements, or if you want to buy your faucet online, just measure the distance from the middle of the main holes (hot side to cold side) on the sink or from the middle of the holes on the faucet. This distance is usually 8 inches, but it can vary depending on the faucet brand, and type. At this point you just need to know what type of new faucet you would like to buy. Most plumbing supply stores, and home stores will have displays set up for you, and knowledgable sales people to help you find a faucet that will provide the look and the features that you want, at a price that you can afford. Be sure to also pick up some new supply lines, and a tub of plumbers putty for reinstallation of the faucet. Apply the plumbers putty around the inside of the base of the faucet to keep any residual water from leaking on to your counter tops. A roll of teflon tape to put around the threads of the shut off valves, and around the threads of the hook ups to the faucet is also a good idea. The teflon tape will ensure a leak proof seal. Prices for new kitchen faucets range from about $25 to as much as $4000. 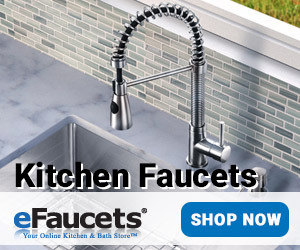 It is very possible to find a good quality kitchen faucet for under $50. I would stay away from generic brands, and stick with a good brand name faucet that will have a warranty, and that will have parts available should you encounter a problem. By learning to repair and install your own kitchen faucet, you can save big charges by your local plumber. With a few tools, a little know how, and some determination, you can fix, and install a kitchen faucet. You can also check out some good YouTube videos on the topic for more information, and advice. If, however, you find the task daunting, finding someone to fix or install the faucet for you is only a phone call away. To save money, you should buy the faucet yourself, and then have the plumber, or handyman install it for you. In most cases you will save the plumber’s mark up this way. Many Americans have saved nothing for retirement. When can I collect Social Security is a question many people ask as they hit their 50’s and beyond. For those of us that are nearing retirement age, having a retirement plan in place is vitally important. The Economic Policy Institute reports that the vast majority of Americans have less than $1,000 in savings, and half of all Americans have put away nothing at all for retirement, even in retirement savings vehicles such as 401k’s, and Individual Retirement Accounts or IRA’s. 35% of American adults have only $400 in a savings account, and 34% have no savings at all. Less than 13% of Americans have a pension plan in place. In a survey by Bankrate, 22% of Americans said their biggest financial regret was not getting started saving for retirement earlier. So, how will seniors, and almost seniors deal with this? According to Gallup Polls and others, many Americans expect to rely more heavily on Social Security, and contributions from children, and other relatives. Originally called the Economic Security Act, the title was changed as Congress considered the bill, Social Security Act was signed into law by FDR, President Franklin Delano Roosevelt on August 14, 1935. This act was designed as a social insurance program to provide a continuing income for retired workers 65 years of age or older. Social Security taxes were collected for the first time in January of 1937, and the first lump sum, one-time payments were made in the same month. January 1940 was the beginning of on-going, regular benefit payments. Originally, only the primary worker was paid Social Security benefits. The first person to get Social Security benefits was a man by the name of Ernest Ackerman, whom received a lump sum payment of .17 cents in 1937. A law change in 1939 included survivors, and the spouses and children of retirees to collect benefits. In 1956 Social Security Disability benefits were also added. The original 1935 law also included the first unemployment compensation program, Aid to Dependent Children program, and health and welfare aid to various states. Cost of living allowances, COLA, became law in 1972, and was initially paid in 1975. Before this, it took a special act of Congress to increase benefits, and happened on an irregular basis. November 1936 is when Social Security numbers were first issued. Since this time over 453 million numbers have been issued. From 1937, when payments were first issued, until 2009, Social Security has taken in $13.8 Trillion Dollars, and paid out $11.3 Trillion Dollars. By law, the the Social Security Trust Funds program assets must be invested in securities guaranteeing both principal and interest. These Trust Funds hold a mix of both short-term and long-term government bonds. The Trust Funds can hold both ‘special obligation’ securities issued only to federal trust funds, and regular Treasury securities. The majority of the securities in the Social Security Trust Funds are ‘special obligation’ type securities. In 2015, the program paid benefits to more than 60 million people, made up of 43 million retired workers along with their dependents, 6 million survivors of deceased workers, plus 11 million disability claimants, and their dependents. Many think that Social Security is on a free fall. You may have heard that Social Security is going broke. This rumor simply isn’t true. According to the 2017 Actuarial Status of Social Security Trust Funds, Social Security isn’t bankrupt or even running out of money. In fact it is currently running a surplus, and is said to be solvent until at least 2034. You can rest assured that Social Security will be there when it’s time for younger baby boomers, Millenials, Generation Xers, and even younger generations to claim their benefits. There are, however, other schools of thought regarding how sustainable the Social Security Trust Fund really is. Some feel that after 2034, due to the large amount of draw from the baby boomer generation, that going forward it could cause too large a burden on the system to continue to pay out in full. Others argue, that due to the smaller family unit of recent, and current generations, as well as abortions reducing the number of potential claimants, that the demand for when can I collect Social Security will be less. This smaller demand should enable the program to continue with little if any reduction. The soonest someone can collect Social Security benefits is age 62, as long as you have paid into the program for a minimum of 40 quarters, or approximately 10 years. Full retirement age is 65 – 67 depending on your date of birth. For each year you delay in taking your pay out, your benefit amount increases by about 8% until age 70. The latest someone can start to collect Social Security benefits is age 70. If you elect to start taking your benefits at age 62, you will receive a reduced rate at 75% of the full monthly benefit. The monthly amount you will receive will depend on how much you have paid into the system, and for how long. If you are a spouse, you will receive 35% of your spouse’s benefit if they begin to take it at age 62. If your spouse waits until full retirement age, you are then entitled to 50% of your spouse’s monthly benefit. Only one spouse can take the spousal benefit. You can also receive spousal benefits based on an ex-spouse’s benefits as long you were married for at least 10 years, divorced for at least 2, and not remarried, even if they have never filed for Social Security. Widows, and widowers can collect survivor benefits starting at age 60. Your Social Security benefit income may increase as your work continues. Your income will be looked at every year, and you will be informed if there is an increase. Starting with the month that you reach full retirement age, you can receive your benefits with no limits on your work earnings. Earnings are considered wages from your job, or from your business, net earnings are taken into account. Interest, investment income, annuities, pensions, veterans or other government retirement income are not counted. When can I collect Social Security was designed to be a supplementary program to your retirement savings, and/or your retirement pension. It was not designed to be a stand alone program. The truth is though that Social Security is a stand alone program for many people because they have not saved for, or set up a retirement plan. I realize that it is not always easy to set up a plan, and stick to it. Life happens, and priorities dictate how the finances are handled. However, most of us, if we live within our means, and devote even a small amount of money monthly towards retirement, we can accumulate some funds that will assist in retirement. Time is your biggest ally. The sooner you get started with a focus on your retirement, the better chance you will have to provide yourself with a comfortable life in your later years. If you have some years before you are ready to call it quits in the work a day world, I strongly suggest you attempt to set something up. Talk to a financial planner at your work if they offer a plan, or talk to a financial planner on your own, or someone else that you trust in the finance/retirement plan area. If you just want to go about it on your own, I recommend you look at dividend stocks, and more specifically, DRIP stocks. DRIPs are dividend reinvestment programs. Some publicly traded companies allow for their stock dividends to be automatically reinvested in the purchase of more stock, instead just paying out the dividend. Many companies also offer No Fee DRIPs which allow you to automatically reinvest the dividend, and purchase more stock from the company for no fees. This terrific benefit can allow you to accumulate many shares of stock for virtually no additional fees. DRIP stocks allow for you to take advantage of the power of compound interest. It is important to know when can I collect social security. The longer you can wait to begin, the larger your monthly benefit will be. As a spouse you are entitled to receive up to 50% of your spouse’s benefits. Even as an ex-spouse, you may be entitled to receive social security payments. You can also work and receive Social Security benefits. Your benefit amount however, may be affected by the amount of your earnings. Even though Social Security is the stand alone income for many people in their retirement years, it was not designed as such. Time is your greatest ally when considering your retirement plan. If you have some years before you retire, you may want to consider setting up a retirement plan at work if possible, or on your own. There are many options to consider, and perhaps the best is DRIP stocks. With a little planning, and some forethought you can make your later years better than what you may have thought.